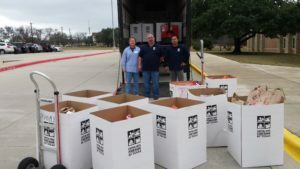 Vandegrift High School and ZumaOffice.com Team Up For 7th Annual Holiday Food Drive. We are excited to announce the launch of the 7th Annual ZumaOffice.com and Vandegrift High School Holiday Food Drive benefiting the Central Texas Food Bank which kicks off today. Sponsored by the VHS Boys Basketball Team, VHS Key Club and Four Points Middle School, the food drive has raised an astounding 12,000 pounds of food for hungry Central Texas during the holiday season. Zuma and Central Texas Food Bank Staff load up pallet loads of food! The first couple of years the food drive generated several packed donation boxes for the Food Bank, and by year 3 students were donating up to 10 – 12 full pallet loads of food that required 18 wheel freight trucks to haul off the contributions. The food drive runs between Tuesday November 27 through noon on Wednesday December 19th. Donation boxes are at the Front Office at VHS, and located in three classrooms at FPMS for anyone who’d like to get involved and drop off a donation. Do Good Work with Zuma, VHS, FPMS and the Central Texas Food Bank this holiday season! This entry was posted in Office Supplies and Charities and tagged Central Texas Food Bank, office supplies that give back, Vandegrift High School, Zuma Food Drive. Bookmark the permalink.